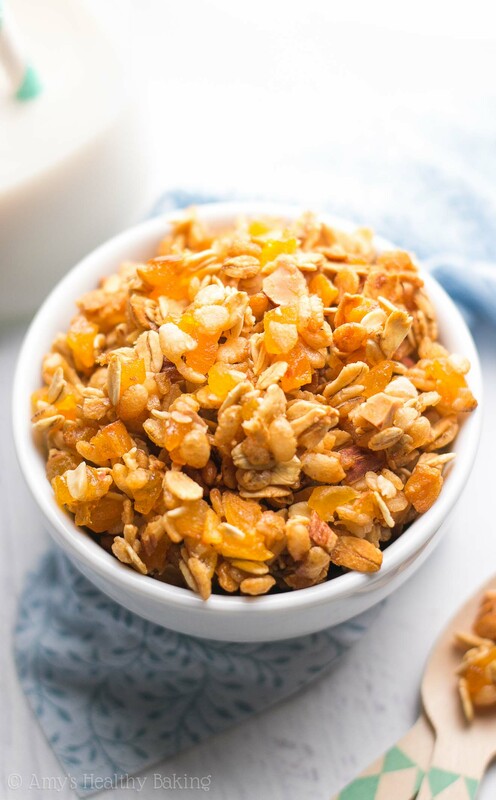 An easy recipe for healthy granola full of crunchy clusters that requires just a few minutes of prep! 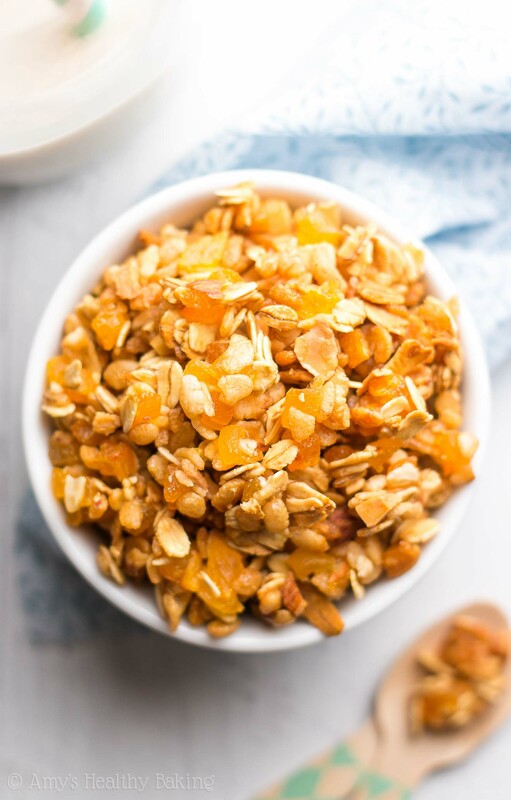 This granola has already become a pantry staple in our house! Last April, I flew to Michigan for the Fresh Coast Retreat (← click over to there if you want to see my life behind the scenes and lots of photos!) along with some other wonderful food bloggers. Since I had only spent time with one of them in person before I boarded the airplane, I started reading everyone else’s blogs and scrolling through their old posts to “meet” them a few months in advance. When I visited Phi’s blog, I immediately felt a connection. Her sweet and conversational writing style, her gorgeous photos, her cozy and completely manageable recipes… And on top of that, she had recently published a few posts on her trip to Paris with plenty of travel tips and snapshots. Those brought back many fond memories from my family’s two vacations to France (and reminded me how much I want to go back again!). By the time I saw her at the hotel’s restaurant and gave her a big hug, I already felt like we had been friends for a long time. Have you ever met someone like that before? Throughout the trip, Phi buzzed around the lake house, keeping the rest of us on track for the retreat’s learning sessions, getting us onto the trolley on time for our special lunch and dinner at top-rated restaurants, organizing our head shot time slots with the professional photographer, and making sure that everyone had enough food to eat and was enjoying themselves. The retreat wouldn’t have gone that smoothly or been that fun without her—she was such an amazing lady to be around! 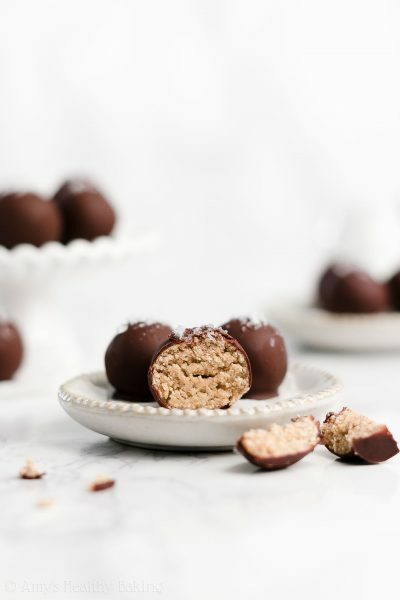 During one of the sessions, Phi mentioned that she had just finished writing and photographing a cookbook that would be coming out this summer, full of easy 5-ingredient recipes that required very little time and effort to make. I immediately planned to purchase a copy the same day the publishing company released it. With how much time I spend testing baking recipes and washing the dishes, I rarely have the energy to cook dinner most nights! But earlier this month, a small package arrived on my doorstep. Since my package of my favorite protein powder had already arrived and I wasn’t expecting anything else, I stared down at it with surprise before carrying it into the house to open. 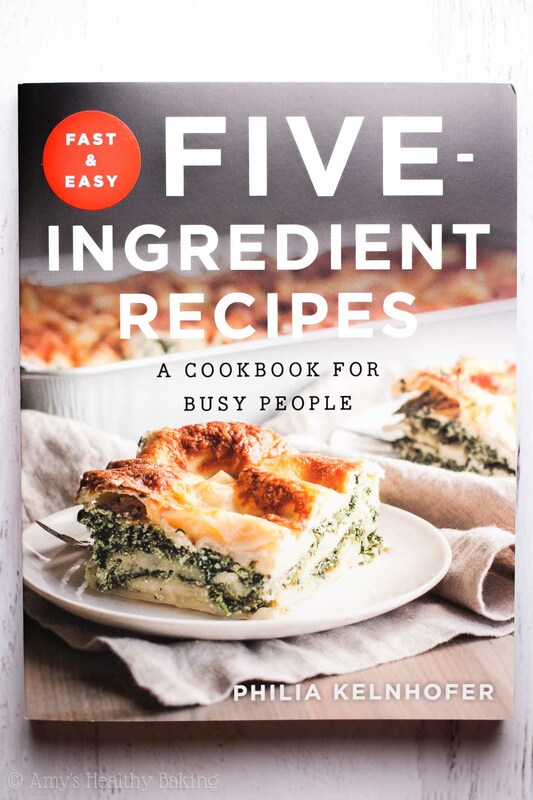 Phi’s cookbook, Fast and Easy Five-Ingredient Recipes: A Cookbook for Busy People! If you follow my @AmyBakesHealthy Snapchat account, then you already saw a sneak peek preview from that same day I opened the package. 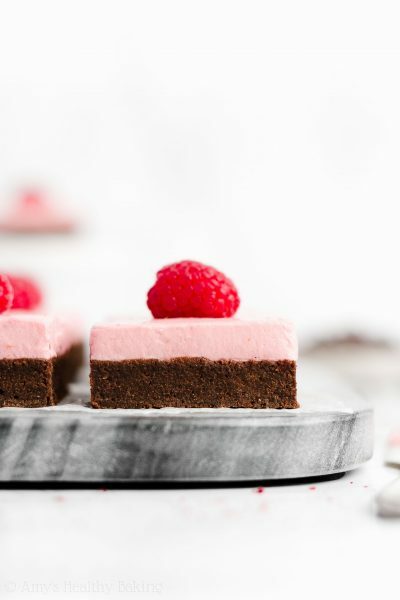 As I flipped through the recipes, each with a full color photograph, I started making a mental list of everything I wanted to try… Which ended up being nearly every single recipe! 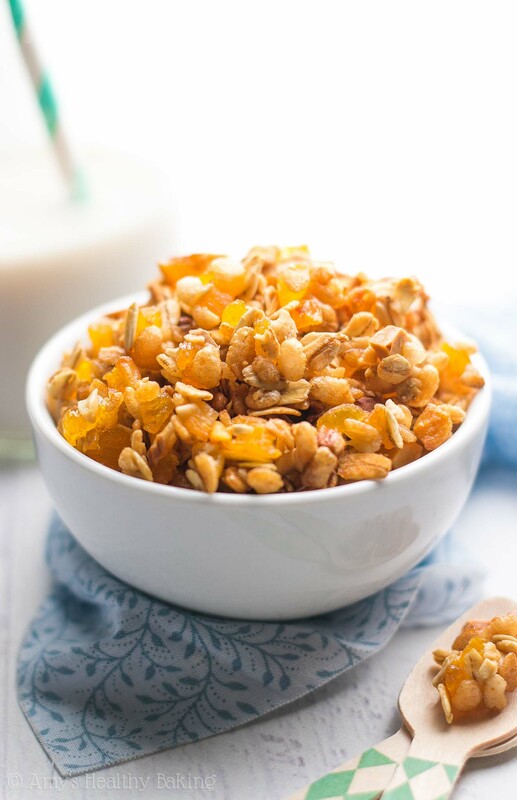 Still, I quickly knew which one I wanted to start with: this 5-Ingredient Trail Mix Granola! 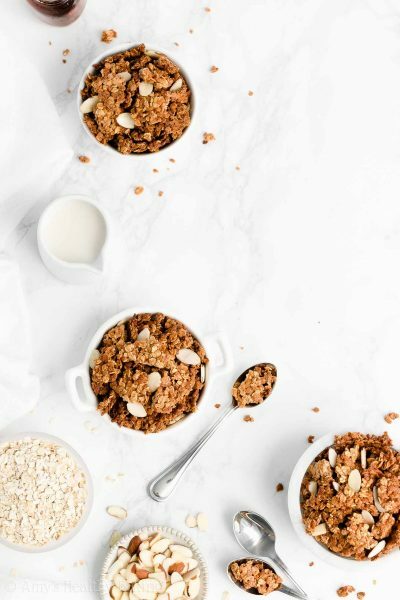 As a granola addict, I can easily polish off an entire batch all by myself in just two days… Breakfasts, mid-morning snacks, afternoon munchies, a sweet treat after dinner, another little bedtime snack… This healthy granola was even more irresistible—and incredibly easy to make! Just a quick note… I slightly adapted Phi’s recipe to fit the ingredients I already had at my house, and that’s the beauty of all of her cookbook recipes. It’s so simple to swap things in and out based off of what you typically keep in your pantry and fridge! To start, you’ll need old-fashioned oats and brown rice cereal. 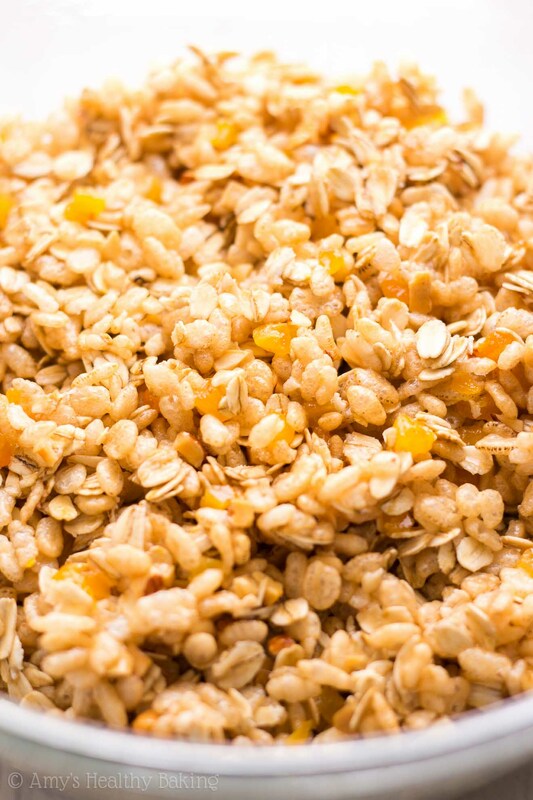 I know… Brown rice cereal sounds like a strange ingredient for granola, but I include it in all of my granola recipes. It provides that delicious characteristic granola crunch for much fewer calories than extra oil! This is the kind that I buy because it only includes brown rice and salt. Next, you’ll bind those together with a mixture of honey and egg whites. I love mixing egg whites into my granola base because they add in a little protein boost! I promise you can’t taste them—just the sweet natural flavor of the honey. For the trail mix, I made my own with a combination of dried apricots, chopped almonds, and cashew pieces. 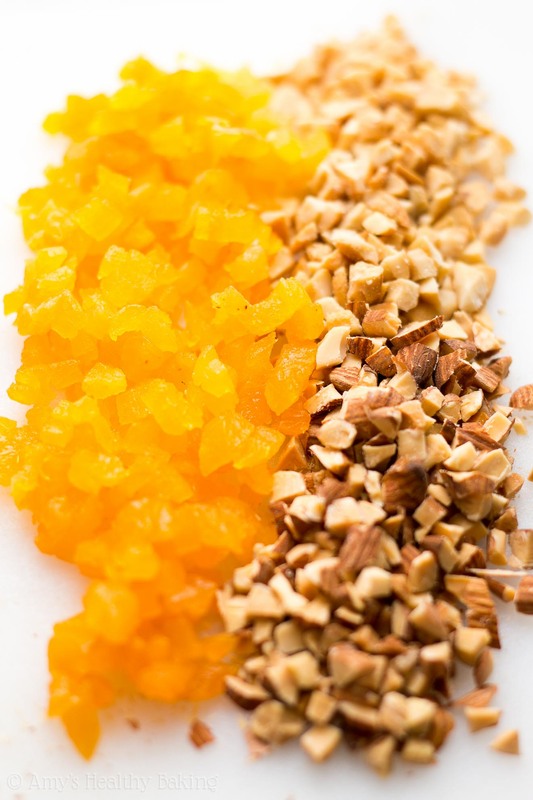 Because I love having a bit of dried fruit in every cluster, I diced both the apricots and nuts very finely, and I highly recommend that you do the same. Nothing beats that bright fruity flavor in every bite! Phi’s instructions direct you to bake the granola on a silicone baking mat or parchment paper on top of a large sheet pan. 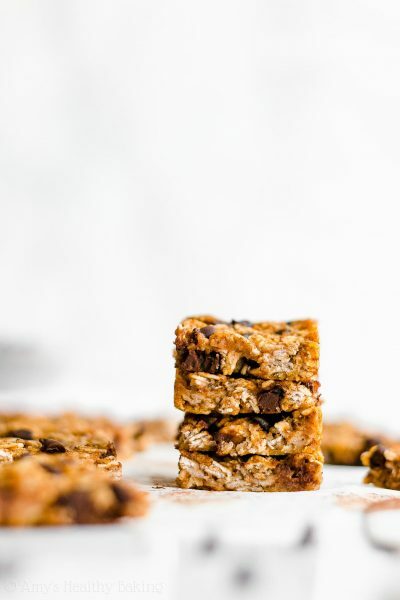 I had never baked granola like that before—I typically use a square or rectangular cake pan—but spreading out the mixture that thinly on the sheet made the granola bake so much faster! I’m always going to bake my granola that way from now on. Such a great tip! Time for breakfast! And snacks… And dessert… And another batch… ? When you make your own, remember to snap a picture and share it on Instagram using #amyshealthybaking and #sweetphicookbook, and tag @amyshealthybaking IN the photo itself! (That guarantees that I’ll see the notification from you! ?) Phi and I would love to see your overnight oats and feature them in my Sunday Spotlight series! 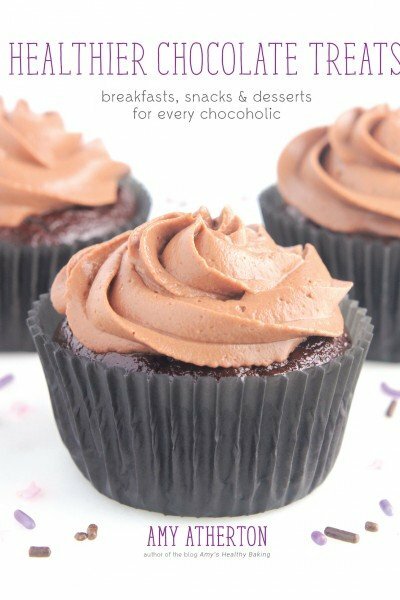 If you love this recipe, then I highly recommend purchasing Phi’s cookbook, Fast and Easy Five-Ingredient Recipes! We’ve already made (and completely adored!) her “Unfried” Cornflake Chicken too—it’s amazing! 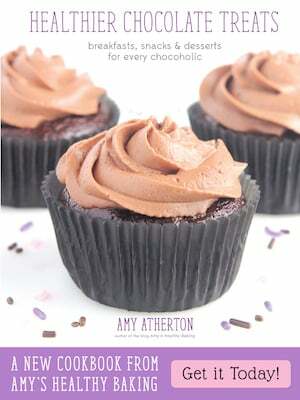 And now for the really exciting news… Phi and I are giving away a copy of her cookbook! To enter, just follow the instructions on the Rafflecopter box below. It sometimes takes a few minutes to load, so be patient! After logging in with your email address or Facebook account, enter using as many options as you’d like. *Fast and Easy Five-Ingredient Recipes Cookbook Giveaway will be open until 11:59 PM Pacific Standard Time on July 28, 2016. Open to the US only. Must be 18 years or older and have a valid email address to enter. Winner will be emailed and will have 48 hours to respond, or else a new winner will be selected. This granola is so easy to make—and even easier to eat! It’s full of natural sweetness and crunchy clusters. It’ll keep for at least 2 weeks if stored in an airtight container. Preheat the oven to 325°F, and line a rimmed baking sheet with a silicone baking mat or parchment paper. In a large bowl, combine the brown rice cereal, oats, and trail mix. In a separate bowl, whisk together the egg whites and honey. Pour the honey mixture into the oat mixture, and gently stir with a spatula until the cereal is evenly coated. Spread the mixture evenly onto the prepared pan. Bake at 325°F for 25-30 minutes, gently stirring halfway through and moving the clusters around the pan to break up the granola and prevent the bits closest to the edge from burning. 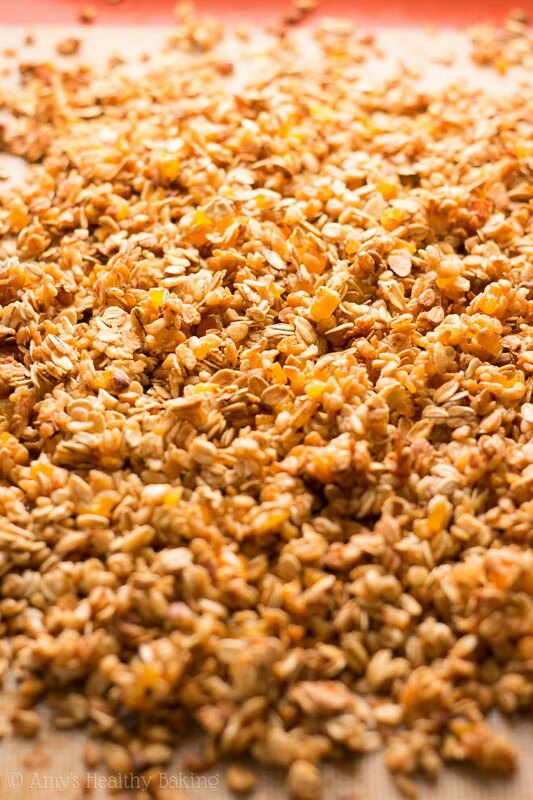 Cool the granola completely to room temperature on the pan before transferring to an airtight container. Notes: Regular crisp rice cereal may be substituted in place of the brown rice cereal. For the trail mix, I used as follows: ¼ cup (40g) dried apricots, 2 tablespoons (15g) almonds, and 2 tablespoons (15g) cashews. I diced all three trail mix ingredients very finely, no larger than the size of mini chocolate chips, to ensure every cluster contained a little bit of trail mix. I highly recommend you do the same! 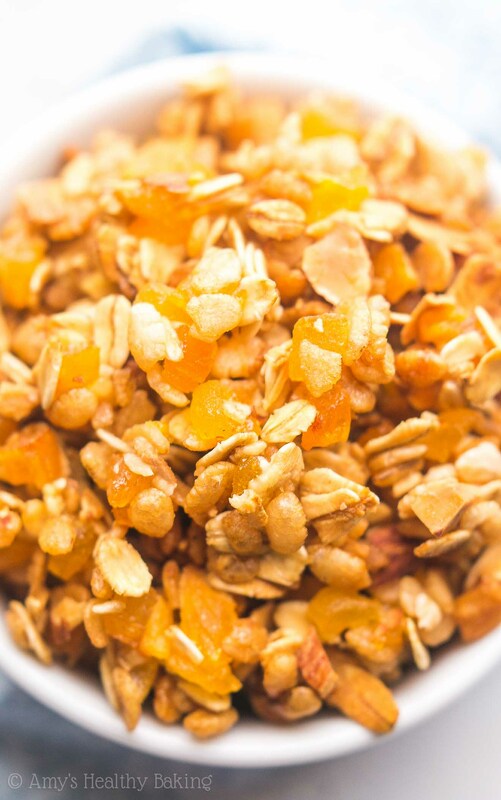 Any trail mix may be used, but we absolutely loved the bright pop of flavor from the apricots! Recipe shared with permission from Fast and Easy Five-Ingredient Recipes Cookbook by Philia Kelnhofer.